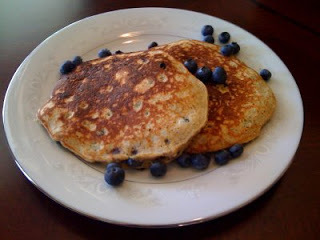 I am powering up breakfast this morning by adding two fistfuls of blueberries to my banana blueberry pancakes recipe. As you know I am on a mission to show that eating healthy is easy and fun. Before we begin, did you know that the blueberry is the #1 most powerful antioxidant? What does that mean for you and me? By incorporating blueberries into our daily nutrition plan, we are protecting our bodies from a multitude of health issues to include heart disease and cancer, and in addition slowing the aging process. For these banana blueberry pancakes, have ready your griddle, oil to prep the griddle, and a bowl. Turn your heat on low, otherwise your pancakes will cook too fast on the outside and be gooey on the inside. Nothing fancy … my tools are a bowl, fork, and a stirring spoon for mixing. In your bowl, smash ripe banana with your fork until it stirs well and juices release, add your whole egg and fork stir into banana until well combined, add 1/2 tsp vanilla and stir again. Put the oats in your electric blender and grind until flour consistency and add to the wet ingredients in the bowl, add your vanilla protein powder, the flax meal, wheat germ, and oat bran, and stir well. The mix will be thick at this point. Add just enough almond milk to make the mixture pourable (careful not to make runny), so add a bit, stir and check. I like my mixture a bit "thick pourable". Now add the 2 fistfuls of blueberries and gently stir into the mixture. Pour 2 equal amounts of batter onto your prepared griddle, cook on one side a few minutes, (check for color by gently lifting an edge), if to your liking, flip over and cook the rest of the way. This recipe makes two large pancakes. Place one pancake on your plate and sprinkle with a few blueberries. I sometimes drizzle a little honey across the top. I eat one and save one for the next morning so I do not have to cook. Really, this only takes about 10 minutes to throw together and you will be done before your tea or coffee is done brewing. Also, a time saver since you have an extra that you can have tomorrow, or for a snack later. Very healthy food. Thanks for sharing.